Hitting: ﻿Chase Turner will cover various techniques that will add additional power numbers to all fields. Including: The use of both Rotational and Linear components in the swing, physics/biomechanical mechanism behind a short powerful swing. Pitching: Coach ﻿Turner will cover basic pitches and correct techniques that will produce more velocity and better rotation. Please arrive 30 minutes prior and bring your hitting gear as well as tennis shoes. 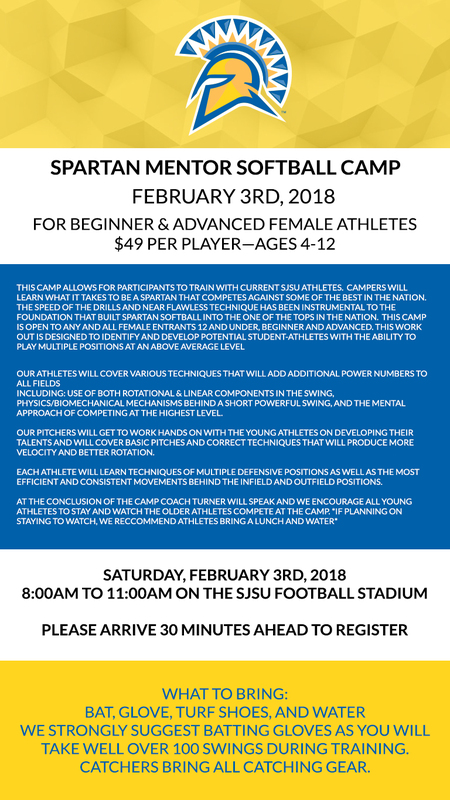 The Spartans are starting off the New Year hosting a camp for ages 10-18!